Stars hum and sing jazz. Jesse and I are both working on big projects related to the blog. We’re going to create separate pages for these projects, but we’ll link to them from LEMUR. Don’t worry, we’ll still keep things here running. Think of these side ventures as long running features for the LEMUR blog. I don’t want to speak for Jesse, but I’m going to be rereading Starman over the next three months and writing reactions/ annotations for the individuals. The idea is that those of you out there that haven’t read it will get hooked and start picking up the issues or trades. For those of you that own the issues or trades already, here’s a chance for you to go back and enjoy them with us. The new Starman page should be up later this afternoon with a post on issue #0. I’m flattered that Matt said he was looking forward to my review of Starman #81, but also a bit surprised. While I’ve definitely loved the series, since he’s a bigger Golden Age fan (and to be honest, a bigger fan of times past) and the one who introduced me to Starman in the first place, I expected that I would take my cues on this book from him. Still, I’ll give it a shot and hopefully not let him down. As disappointed as I am in the Blackest Night experience so far, this is the perfect opportunity to revisit Opal City. This is a natural tie-in since most of The Opal’s heroes are gone at this point. Most of the story revolves around the relationship between The Shade and Hope O’Dare, whose soap-opera ramblings seem completely out of character. This is not a Shade I recognize, and even though he doesn’t seem to recognize himself anymore, either, the difference is just too stark. By the end even his speech patterns have changed to become Jack’s, with verbal pauses and references to Crackerjack prizes. The art isn’t doing the story any favors, either. 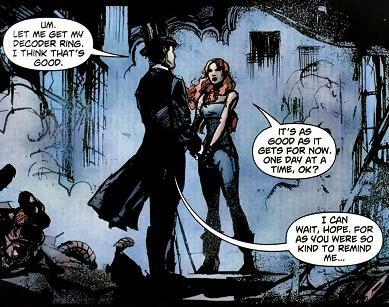 I’m not familiar with Fernando Dagnino’s work, but it was completely overpowered by Bill Sienkiewicz. 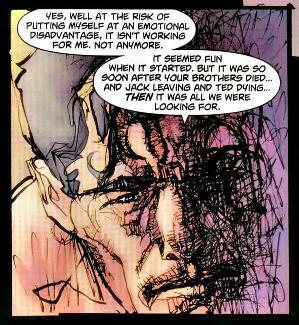 Maybe it’s just because I don’t get Sienkiewicz’s art in general, but it was too sketchy for my taste, and the characters look far too different from the people we’re used to. Matt’s right, there’s an awful lot crammed into one issue. I imagine it wouldn’t have been quite as rushed if Robinson had all the space he needed rather than just a one-issue tie-in. I’m still willing to believe that a Starman revival could work, but only when Robinson finds his (and the characters’) voice again. It’s great to see our friends after so long, but if these aren’t the people we know then there’s little point. Starman 81 isn’t a bad issue, but it’s not stellar (no pun intended). I just hope that if we see more of Starman and opal City, Robinson gives himself more of a warm-up to really get back into the rhythms of Opal City. Because of the Martin Luther King holiday, I’m surprised that New Comic Book Day (from here on NCBD) is still Wednesday, but Diamond says it is, so it is. Maybe they’ll startle me by having shipping some comics I’m actually going to pick up. Here’s what I’m looking at this week. AVENGERS VS AGENTS OF ATLAS #1 – I hope there are some extra pages in here to justify the $4 price tag, because I really want to read this. BLACKEST NIGHT THE FLASH #2 (OF 3) – I completely forgot what happened in the first issue and I haven’t read one BN mini that I’ve actually enjoyed (JSA is still waiting on me), so I’m going to pass. STARMAN #81 (BLACKEST NIGHT) – It’s James Robinson and it’s Starman, so I’m in, but I’m only cautiously optimistic. My confidence is that Robinson’s more attached to these characters, than I am. The synopsis sounds good, though. And…I guess that’s it for me. Another stunningly light week. Expect some back issue reviews later in the week, because I’ve been reading some pretty cool stuff lately. And what are YOU getting this week? I don’t know about anyone else, but my jaw dropped the other day when Dan DiDio announced that Starman would be getting an issue 81 as part of Blackest Night. First things first: James Robinson is writing, and I have to assume he’s on-board with anything DC has planned; that’s the most important thing. But the whole topic got me thinking about endings, and the strange relationship fans have with them. Robinson has said in the past that he’s always being asked about bringing Starman — Jack Knight, specifically — back. While that’s somewhat reassuring, because it never felt like that title had a particularly strong fanbase while it was being published, why would anyone want to destroy the life of a character they love? To jump back a bit, in 2001 Starman ended with issue 80, when Jack Knight gave up the hero game and moved to San Francisco to be with his girlfriend and son. He received what too few of our favorite characters get: a happy ending. Spider-Man has been continuously published since 1962 and can’t stop getting dumped on. It’s even worse when you think that all of those bad times have happened in the span of roughly 10-15 “comic” years. He needs a BREAK! I’m sure all of us have a favorite series that was canceled before its time. Those usually end with our hero embracing the future and the unknown, which is almost certain to include more heartache and villainy. But Jack? Jack got a graceful, beautiful exit. He got the rare chance to put that life behind him. Since he was a reluctant hero even at the beginning, I can’t imagine anything that would bring him out of retirement other than evil, and I can’t wish that on him. Which brings us to Blackest Night. Robinson, at least for the time being, has wisely decided to let Jack stay happily out of continuity. This seems to indicate that we’re going to see a Black Lantern Ted or David Knight, and I’m not afraid to say that while so far none of the other Black Lanterns have disturbed me, I will be absolutely horrified to see those two characters desecrated and zombified. We all have a tenuous relationship with endings. 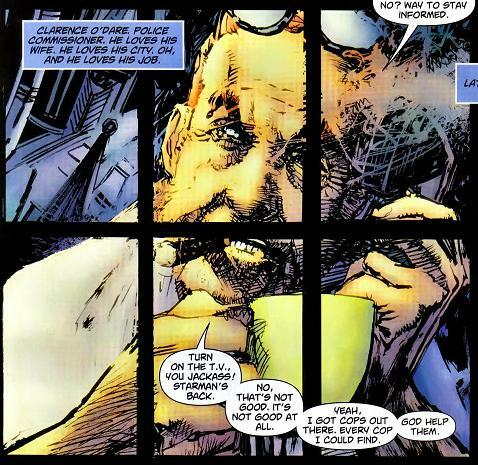 Spoiler alerts are necessary on the Internet and DC had to do some spin control after Previews revealed the villain behind Blackest Night, yet in every interview or convention panel, without fail there is someone who wants the ending told to some ongoing story. Our love/hate relationship with finales apparently holds true even if a series has been over for 8 years. Perhaps it’s the serial nature of comics that sends us on the incessant quest to learn what’s next. Is anything ruined when there’s always another event or issue to look forward to? Maybe it’s just bragging rights to guess the ending first or trick an Editor into revealing more than he intended. But if there’s anything I’ve learned from superheroes it’s that sometimes a person MUST do the selfless thing for the greater good. Let’s let Jack Knight live in peace. It’s the heroic thing to do.